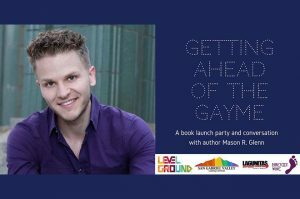 Please join us for a fun and informative evening as Mason R. Glenn has a discussion about his book, an “Amazon #1 New Release” Best Seller, with Jessica Lynn Johnson, a professional actress and solo artist. Please RSVP via Eventbrite. There will be books for purchase for $20, cash, but it is encouraged to get them in advance via Amazon. You may also do Venmo or PayPal (CC). Come grab me, and I’ll sign your copy if you want! Digital download also available through Kindle, GooglePlay, and iTunes. Suggested donation of $10 is encouraged and will be donated to Level Ground and the San Gabriel Valley LGBTQ Center, all of which are local charities that support LGBT advocacy. Thanks to Barefoot Wines and Langunitas Brewing Company for helping us sponsor the event. Light snacks will also be served.